An activist had a few of the above stencils at the Ai Weiwei "@ Large" opening on Alcatraz Island, SF, CA. Check out more about Syrian activist Bassel Shehadeh. A few photos of stencils being used for protest during the historic People's Climate March in New York City are starting to get posted. From time to time today, Stencil Archive will update New York City's Archive with any stencils that make the social media streams. Stencils appeared at the #floodwallstreet march on Monday 9/22 today, with images by 1980s stencil master Seth Tobocman. So social media streams were scoured today for photos of the march on Wall Street and they also appear in the NYC archive. Stencil Archive just got an upgrade! Woah. Do things look different around here? Can I now bookmark Stencil Archive on my mobile browser home screen and click anytime to enjoy the latest and greatest in negative space? Has everything changed? Many questions with a few easy answers. Welcome to the latest version of the Stencil Archive, including all the fresh content you've grown to love over the years but with a new look. The site is now responsive, which is techy speak for "you can open in up on your iOS or Android device and flick around the site." 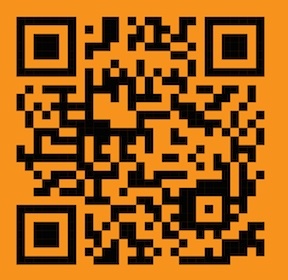 Try it horizontal or vertical! Only the look and response to where you're looking has changed. Go to the page you want to save. And NO NO NO.... there won't be any pop up/drop down pages asking for your email (or showing ads), kickstarters, indigogos, personal info collecting and sales, mbedded/wiggly ads, useless clickbait, or other crappy money-making schemes. If you wish to support the site, a simple donation will do (see the s/tour page for ways to contribute). 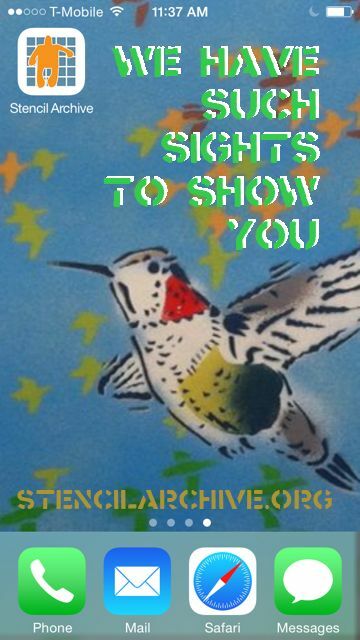 And YES YES YES.... please submit photos, links, videos, gallery openings and anything stencil-related. Here's to another 12 years of stencil fun. Photo: Haight Street, San Francisco. Artist unknown. Woah now! Years in the making, since 2002, Stencil Archive takes a slow and steady approach to the photos it archives and presents. Practically hand curated in an attempt to not post a second photo of the same stencil, this site strives to not judge any skill level, content (unless racist or pornographic), or other qualities. When it comes to street art, off and on the white walls, the stencil tool is open source, for the people, and for anyone who has an idea to cut out and paint. Thanks for the first 20,000 photos and onwards to thousands more! Very soon, something amazing will happen here on Stencil Archive. It may not be what you think it will be. Stay tuned for upcoming surprises! Back when Banksy was in SF promoting his documentary, I got to meet Sami Sunchild and talk about the large rat that was on the side of her Red Vic bed and breakfast building (read about it). I introduced her to Banksy via my book as well as the artist's own. And her manager let me go onto the roof for exclusive shots of the socialist rat (see my photo below). Ever since I saw the empty space on that wall get replaced with plain wood by a work crew, I've wondered who took the rat and what it's fate was. At long last the SF Chronicle tracked the owner down. And Sami asked him to never sell it. End of story? Art restorers in Santa Barbara began work last week on an unusual canvas: 10 graffiti-covered redwood boards that were ripped from the side of a Victorian home on Haight Street. Spray-painted on the slats is a beret-wearing rat clutching a Magic Marker, the stenciled work of anonymous street art superstar Banksy, who tore through San Francisco in 2010. Private collectors have extended six-figure bids for the piece. But a self-described "art freak" from San Francisco who owns it doesn't want to profit from the piece, and he says he can't without breaking a promise.